CEDAR CITY, Utah – Dec. 14, 2007 – This week, a 22-year-old transgender student in Cedar City says he was denied campus housing because of his gender-identity and expression. 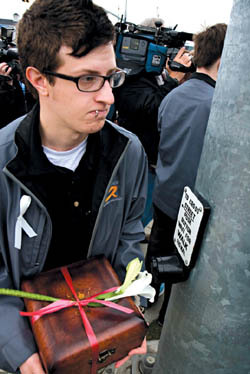 Kourt Osborn (pictured right), decided to be open and honest about his gender identity as he prepared to attend courses Southern Utah University (SUU) in the Spring 2008 semester. SUU is a publicly funded state university. On December 1st, Kourt turned in his application into the housing department, in which he fully disclosed his gender identity. He never expected what came next – a decision to deny him housing in both the women’s and men’s campus dormitories. During the 2004-05 school year, Kourt lived in women’s housing at SUU. Since then he has lived full time as a man, so this time Kourt knew housing in the male dormitory was his only option. This time, he prepared a long essay explaining his circumstances to housing officials. In an effort to educate officials, he also detailed several issues that transgender people like himself must face. After submitting his application to live in the male dormitory, Kourt thought things were going as planned. When he received a message from housing officials on December 12th, he knew something was up. On Thursday, December 13th, Kourt met with Neuman Duncan, Director of University Housing, for over an hour. During our conversation,” Kourt said, “Duncan told me that a sociology professor on campus believed I am ‘not truly a transsexual’ because I do not seek sexual reassignment surgery. Duncan refused to identify this professor, or the ‘team’ of people Duncan allegedly met with about my housing request. I don’t believe Duncan consulted with any experts on transgender issues either.” Kourt went on to say that his major is sociology, and now he must reconsider how comfortable he feels in that department. Valerie Larabee, Executive Director of the Utah Pride Center, expressed concern about Kourt’s account of SUU’s actions saying that, “SUU administrators could have taken this opportunity to reach out and better understand the issues transgender students face as they seek access to public education. Their invasive requirements for Kourt to be granted access to housing are yet another example of the need for non-discrimination policies which include sexual orientation, gender identity and gender expression.” “SUU has an opportunity to set the Utah standard for public education housing equality,” Larabee added. – official documentation that he has undergone sexual reassignment surgery. Kourt claims he was told that if he did not present the three items requested by the university, then he would not be allowed to live in male housing. At the same time, he says the university has denied him placement in female housing, saying female residents may feel uncomfortable. Kourt had already provided the housing department with a letter from a doctor who monitors his hormone treatment. For personal reasons, Kourt does not seek to be diagnosed with “gender identity disorder” and does not want to seek sexual reassignment surgery. Kourt says a letter denying his housing application is in the mail. At this time, Kourt says he is not allowed to live in any part of the public university’s campus housing, even though two of the four residence halls offer private bedrooms and private, lockable bathrooms (see attached floor plans). He is currently considering his options regarding how to proceed with the issue, and maintains that he is dedicated to eliminating discrimination at SUU. On Friday, December 14th, Kourt began the process of filing an official grievance with Dale Orton, Vice President of Student Services, yet he has been unable to set an appointment with them to date. “I thought it would be easiest to live in on-campus housing. I was wrong. Really wrong,” he said. “I can find other places to live, but I believe this has gone far beyond just me. What about other trans-people that might want to live there?” Despite feeling the pain of being discriminated against, Kourt said he would still consider living in the dorms if he is allowed to do so, but wants to ensure that a university-wide policy change occurs so others do not have to experience this infringement on their rights as students and individuals. “I learned who I was in the dorms through the friendships I made there,” says Kourt. He would also appreciate a public apology from the housing administration. In other parts of the country, other universities are taking the steps to ensure that housing discrimination does not occur on their campuses. The National Student Genderblind Campaign, founded and currently led by Guilford College (Greensboro, N.C.) student David Norton, was formed to battle just this kind of situation. The Campaign encourages education, awareness and policy work to create new avenues for gender-neutral housing on college campuses. According to this their research, 23 colleges or universities across the nation currently offer some sort of gender-neutral housing policy, in whole or in part. Southern Utah University is not one of them. Thank you for all your help. I realized that in the beginning of the 5th paragraph (the one that starts with: Valerie Larabee) I accidentally repeated her name and title, so you may want to remove that. I am not a good proofreader!